"Have you ever had the nagging sense that there's something not quite right with the adulation that follows Malcolm Gladwell - the author of Tipping Point? But you couldn't quite put your finger on it? We're here to help, dear reader. 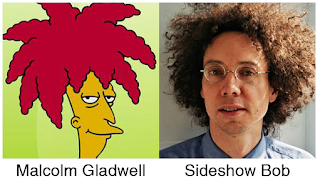 Gladwell gave two vanity "performances" in the West End - prompting fevered adulation from the posh papers - the most amazing being this Guardian editorial, titled In Praise of Malcolm Gladwell. It appears that we have a paradox here. A substantial subclass of white collar "knowledge workers" hails this successful nonfiction author as fantastically intelligent and full of insight - and yet he causes an outbreak of infantalisation. He's better known for his Afro than any big idea, or bold conclusion - and his insights have all the depth and originality of Readers Digest or a Hallmark greeting card. That's pretty odd."